Didn't have time to post updates last week, so once again I'm behind on that. The price I pay for keeping busy, and I pay it gladly. We are probably witnessing the rise of another gifted director here. Blomkamp is giving a capable talent the same chance he himself was once given by Peter Jackson, based on the similar tactic of making a short film to entice others to buy into the outlandish concept. And a rather ambitious concept it is. In just a few lines of text, space travel, exotic alien life, epic man-versus-nature battles and slave labour is introduced, and then the trailer itself hasn't even started yet. So please, make this film about people forced to hunt space whales. I just hope Robinson is on the side of the unfortunate creatures, as I absolutely do not consider actual whaling a noble endeavour. But then, if 'involuntary labour' is needed to harvest the 'exotic matter' from the animals in question, the whalers definitely aren't the good guys. At this point, a studio has already picked up the rights, and it's 20th Century Fox. Will they deliver the obviously large budget Robinson requires to make his picture? They have a bad track record when it comes to appreciating awesome science fiction concepts, so they definitely wouldn't have been my first pick. But hey, Robinson surely won't complain, since he has finally succeeded at snagging a studio and producers to make his movie. Speaking of which, there's a few similarities between this Leviathan and Don Lawrence's Storm, the latter which I always hoped would make it into a movie some day. Maybe Leviathan will still my need for a Storm flick, or maybe it only proves that if you sell your Sci-Fi concept the way Robinson did, you can eventually usher your dream into theaters after all. I thought Tom Cruise had by now established the fact there are no impossible missions anymore, but apparently, I was wrong. So another totally outrageous mission is concocted to make Cruise once again play the Hollywood superstar. You know, the type that sees his name stamped on promotional material in a bigger format than the movie's actual title. The all-American hero that travels the globe to all manner of exotic locales the common American has never heard of (like Moscow or London), all the while kicking bad guys' butts, bedding insanely hot dames and shouting silly oneliners at every opportunity. Cruise still can't get enough of it. I for one, care little, but then I never did from the get-go. This time Cruise and his team hunt down a shady organization much like their own, their insidious doppelgänger as it were. Isn't that also the plot of the new 007 flick, Spectre? And isn't James Bond a more sophisticated and better loved take on Tom Cruise's character for that matter? Seems like we're hitting another one of those circumstances where two movies sharing an awfully similar concept see release with only a short interval between them (think A Bug's Life/Antz or Deep Impact/Armageddon). I know what team I'm betting for and it's not this one. That picture freaks me out. What a sinister mug shot, the face of an evil, evil man no doubt. Not so long ago it had curly hair and was applied to the role of far more likeable characters. But now that dear little neurotic guy from the likes of Zombieland and To Rome with Love is playing the big leagues as a major villain based on comic book material. Eisenberg's Luthor will soon be seen harrassing various superheroes throughout the DC Cinematic Universe, starting with both Superman and Batman (a single hero won't do, of course). He'll basically be DC's answer to Tom Hiddleston's and Marvel's Loki, which is definitely a tough act to follow. As a megalomaniac captain of industry, Eisenberg will play the second next grandiose thing to a crazed Norse God. He'll probably do just fine, but I still won't care as much, considering I really am on Marvel's side. I've always considered DC's characters a little too larger than life, less easy to identify with as a regular guy. You'd think I'd find a megalomaniac captain of industry more easy to digest than a crazed Norse God than, but apparently it doesn't work that way. Just goes to show what a particular geek I am in my tastes. Well sorry. Mr. Eisenberg. Speaking of my particular tastes, Dr. Who isn't one of them. I never really could get into it. So I've never seen Matt Smith in action, but if he's playing Dr. Who, then he must be the British sort, which means he'd do nicely in the Potterverse. Even though we're not talking Harry Potter here, casting an American in the lead role would be an act of blasphemy, as I'm sure Mrs. Rowling has made quite clear to the producers of the upcoming spin-off Fantastic Beasts and Where to Find Them. Plus, Matt Smith might make a nice change from Benedict Cumberbatch, who these days is considered the quintessential Englishman to cast in any rol pertaining to Brittania, good characters or bad. So yeah, throw Smith a bone and cast him as Newt Scamander. I'm sure he could effortlessly switch between silly aliens and robots to equally silly magical shenanigans and monstrous entities. 'Silly' not prohibiting a wonderful sense of adventure and enjoyment of course. Just serving a very British kind. Another particularly European sense of adventure and enjoyment is found on the pages of Belgium's comic industry. And this one unfortunately has suffered from ruthless Americanization in recent years. Both Smurfs movies were strong examples of how not to adapt beloved comics (or cartoons for that matter) for modern Western audiences. Trading in a medieval European setting for contemporary New York was both insulting and painful to behold. So even though the American presence behind the cameras remains, a totally new kind of direction for this blue little franchise is nothing short of a good thing. Going fully animated also meets my approval, as it will prohibit actors not up to the task from sharing the screen with the delightful creatures we really care to see. Heck, if Gargamel wasn't such a recognizable foil to the Smurfs, I'd say go and make an all-Smurf movie without any human (or feline) characters, one hearkening back to the classic stories of old (as the director claims is his intention). I'm all for adapting the Smurführer story, though I think that one might be a little too controversial for Hollywood's taste. Same goes for the one about the disease spreading primitive Black Smurfs. Nevertheless, both of these concepts would make for movies ten times more compelling than the dreck released this past decade. 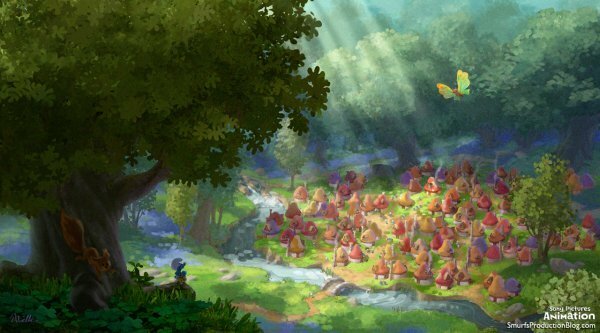 I'm hopeful the studio means to honor their statement of indeed taking the Smurfs back to their roots and completely ignoring said damage, but I know better than to get my hopes up too high. At this time, my hope has reached a level of about three apples high. If the people behind this movie have any inkling what that means, it's an indication they're indeed on the right path.